Powder coating is one of the leading industrial finishing processes, as it helps in creating better corrosion-resistant coatings, which is a key requirement in many industries. In this process, a part is electrostatically coated, and is cured under the heat. The curing is performed using a special type of oven, which is known as a powder coating oven. These equipment have the capability to sustain temperatures as high as 500°F. ACE Equipment is an experienced powder coating oven manufacturer in the USA, which can help you with these equipment. Uniform Air Distribution: Uniform air distribution is provided by these powder coating batch ovens along the entire length of the work chamber. This helps in optimizing the cure cycles, as well as improving the quality of cured finishes. Temperature Uniformity: Even the second hand powder coating ovens that we provide have an exceptional temperature uniformity. This helps deliver consistent, and high-quality curing. Instructions: These ovens come with details about the startup and operating instruction of these ovens. Low Installation, Startup, & Maintenance Costs: The installation, and startup of these electric powder coating ovens or electric batch ovens requires lesser cost compared to other ovens. In addition to this, these ovens require little or no maintenance, which further reduces the maintenance cost. Proportional Heat Control: Accurate temperature control is achieved by the modulating gas valves present in the gas-fired ovens, and SSR (Solid State Relay) and SCR (Silicon Controlled Rectifier) contained in the electrically heated ovens. This helps deliver consistent results. Fresh Air Filter: The ovens come with fresh air filters, which are cost-effective, and replaceable. This helps protect the ovens from contamination, and offer a clean work chamber. You get an optional combustion blower inlet filter for the gas-fired batch ovens. High Volume, Low Impingement: These ovens feature standard combination airflow. Besides this the rework is reduced considerably by the absence of powder blow-off. This helps in achieving high volume and low impingement. Compliance with Standards: ACE range of powder coating curing ovens are designed and built in such a way that they comply with all the industrial and commercial codes and standard that are applicable. Heavy-duty Construction: Galvanized steel is used in the wall and roof of these ovens. Their doors feature beefy hinges and tough frames. All these features make the ovens strong and durable. Quick Heating: These ovens feature high-quality burners, which help achieve quick heating. Ease of Operation: These powder coating curing ovens are extremely easy to operate. Branded Components: The use of high-quality components from well-known brands, such as Honeywell, MAXON, and Bradley, helps us craft world-class curing ovens for powder coating. 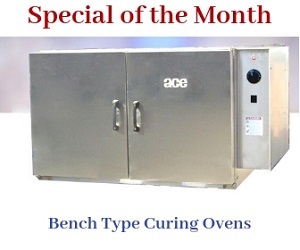 Get the most reliable and affordable powder coating batch ovens from the expert in the market - the ACE Equipment. We provide you best quality industrial curing oven that has a solid reputation all over the globe. ACE ovens are being used successfully in finishing systems throughout North and Central America. Be productive this quarter with custom powder coating ovens. Request an Oven Quotation or download a Request for Quotation Form - MS Word doc. Call toll free 800-255-1241or ASK Scott Now!